But he also likes to dabble in another art form — the English language. Petersen puts his pen to the paper (rather, his fingers on the keyboard) quite often to share his lesson plans with a nation-wide audience in the magazine, arts & activities. 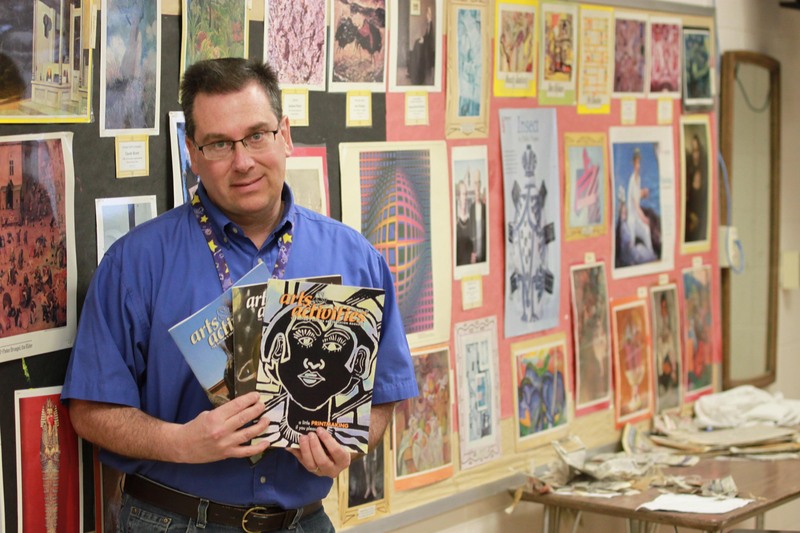 To date, Petersen has had 17 of his art lesson plans published since he started contributing to the magazine in 1989. The magazine regularly publishes lesson plans developed by teachers from across the country. The trade magazine is considered by many to be tops in its category, Petersen said. Each lesson Petersen submits contains a thorough explanation of the project and how to create it, from start to finish. His latest published plan was about creating colorful chameleons using different colors, shapes and textures. Some of the magazines Petersen has been published in. Petersen’s published lessons have covered the gamut of materials, including print-making, clay, drawing, jewelry and more. He focuses his lessons on projects he does in class with his students. That sometimes involves Petersen doing a project himself, then re-doing the project again so he can describe the steps along the way. This entry was posted in Darien Elementary School, Delavan-Darien High School, Delavan-Darien School District, Phoenix Middle School, Turtle Creek Elementary School, Wileman Elementary School and tagged art, Phoenix Middle School. Bookmark the permalink.